Family members of all ages can enjoy a day out together in Plymouth! We’ve suggested a great day out, so all you need to do is head out into the sunshine and make happy memories. Start the day with a hearty brunch at Seco Lounge or Column Bakehouse in Royal William Yard. After breakfast hop on board Plymouth Boat Trips for the quick journey over to Mount Edgcumbe House and Gardens. With hundreds of acres to explore, there’s plenty of space for walks or a paddle on the beach. Older children and teens will want to get stuck in at Adventure Segway. Take on a Segway Skills assault course and venture out, gliding for miles on an instructor-led expedition across the park. For lunch, catch a boat back to the historic Barbican and indulge in some delicious fresh fish and chips for lunch. Why not treat yourself to a cream tea too, though be sure to do it cream first, the proper Devon way! In the afternoon take a walk up to Plymouth Hoe, there’s plenty of space here for children to run around, fly kites and play games. 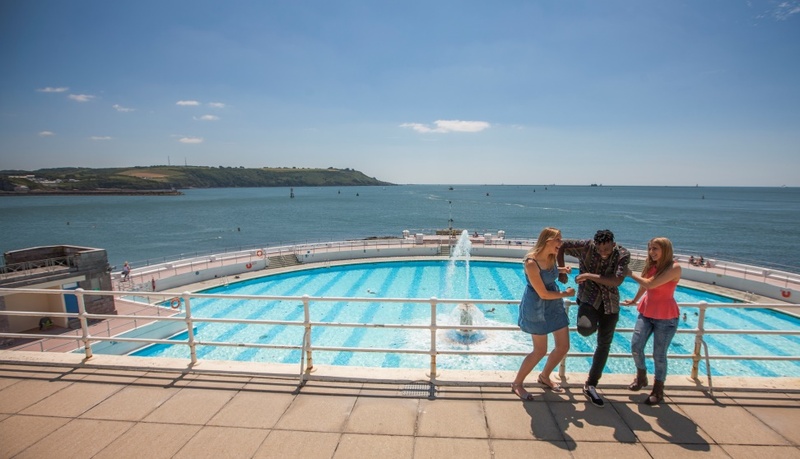 If it’s a sunny day, go for a dip in Tinside Lido, an art deco, salt water swimming pool. Wander further along the waterfront and you’ll discover West Hoe Park where there’s lots to keep both big and small kids entertained! Play crazy golf, bounce on the trampolines, ride on the miniature train and explore the pirate themed Treasure Island Park. For dinner head back to the city centre to Bill’s for a relaxed meal that everyone will enjoy. Smeaton’s Tower, climb the steps up to the top of Smeaton’s Tower to see some incredible views across the Sound and imagine what life would be like living inside a lighthouse! The Central Park Play Space, a newly refurbished park with spaces designed especially for toddlers and adventurous outdoor play for older children. Teens will love the nearby skate park too!